The Japanese have been in love with Beethoven’s 9th for a century and more. Toshio’s generation college students, practically all, have the Ode to Joy memorized in German. This concert was in 仙台Sendai, a city in the area of the earthquake/tsunami…. they certainly needed an uplifting Event, with a 10K strong chorus. My All Nippon flight landed in Singapore 3 minutes ahead of the scheduled arrival time of 23:55, despite there was a 30 minutes delay in taking off. What is Boingo? The wi-fi network in the Narita Airport. It’s Bingo slightly off-spelt. It is Murphy’s law. Train and subway services were suspended again unexpectedly this morning. The suspension was supposed to run from 11:00 to 17:00, but the suspension was there right there and then when I arrived at the station at 10:20 a.m. “Is there going to be a scheduled energy release at the nuclear plant, or is it a practice to conserve energy?” I wondered. But either way, this was not a good sign. Got together with a young Chinese couple with two children from Bangkok….took the taxi….then the Airport Bus to Narita Airport. A 2 hour trip. I told the couple whether the flights were operating or not, we ARE going to stay out at the Airport, the closest point of exit. Who knows what is going to happen next? Roads, not only railways, may be closed too and with no little or no advance notice. I don’t blame the government in crisis like this. At the airport…. crowds, lineup’s, blankets (on the floor…must be from last night), panics, food and drinks out (the only food supply was the few Bento boxes on the shelf in the waiting area), people sleeping on the floor. Strike a conversation with some UA air hostesses. They are not on duty, but like me, they are finding their way out of the country (for them, it’s to Chicago). One of them said she is not going to fly this route again….too stressful for her. We shared our experience … gym…the cold cold gym (they were not fortunate enough to have an alternative like what I had up at Nikko) and the fear of the nuclear plant meltdown that made them decide to go on the dot. The wi-fi is slow. Jams again! No time to buy any seaweed on the way to the train station. Only have time to reload the phone card since it was a concurrent operation with the check-out at the hotel. Finding food, let alone seaweed in Narita, is difficult. Imagine this is an international high traffic airport! Good that I still have my supply of chocolate, almonds and raisins. Met more UA air hosts and hostesses again in the waiting area. None are on duty….all finding their way home…Honolulu, England etc. And…got a chance to use their wi-fi network which works faster. All things have been packed. It’ a matter of checking out. The plane is not leaving till 17:10, so there is some time to kill before the latest train of 12:47 to be on time 3 hours before departure. I made my round of calls to my family members. As usual, I fill my thermos mug with tea for the road. Will load up the phone card before I leave the hotel just in case…..despite it is almost impossible to get thru any LAN lines. My daughter told me there is a saying in Canada that the Japanese authority is playing down on the seriousness of the nuclear plant matter. But I told her that this is management practice. You cannot panic yourself despite you know well it is dangerous. This is to calm the people around you. All you can do is to put your best forward to contain and control the situation. Ueno Park is just right next to the Keisei Train Station where I will board the train to the airport. Well, I will pull my luggage with me (good that I travel light…only a small suitcase and a duffle hand-carry bag) and check out the cherry blossom before I take the train. Yesterday, I saw a blossomed tree close by the garden of the Imperial Palace. I will miss the kind-hearted people I met here in Japan….my host in Nikko who offered me, when I turned up unexpectedly the second night in his guesthouse, a bowl of rice and a coleslaw (their salad and vegetable); his constant update of the disaster situation and his advice…..the hotel frontdesk staff here in Tokyo….the hotel’s kind gesture of refunding me for nights I can’t stay due to the disaster….Aeroplan which allowed me to change flights without charge on a ticket redeemed with travel points in this emergency situation…the girl from Chekiang, China whom I met and had a trip-long conversation (in Mandarin!) on the train from Nikko….the two French boys who left Nikko the morning of the disaster for Kyoto (I hope they arrived safely)….and to those who have to stay behind. Growing too sentimental? Yes and no…but just in case the energy in the nuclear plant has to be released! I woke up. Slept well. Not conscious of any sways or movements while at rest. No dreams either. This petite hotel is in a 5-storey building. There had been movements last night and just now (8:31 a.m.). Last night, I went downstairs to the front lobby to confirm that indeed it’s the earth, not me, that was shaking. Those Caucausian boys and girls sitting in the lobby working on their Wi-fi did not seem bothered by the movements. They looked at me like a weird creature when I enquired the front-desk about the sways. Good to be on the first floor. It’s fast to run down in case of emergency. Put all essentials in one bag. That’s all I will take when I need to ‘run’. Will plan my itinerary for today later depending on what transportation service is available. May test my legs for long walks. Will go back to Ueno Park to see if there are more buds now for the cherry blossom. Half an hour ago, I moved my flight out to Singapore ahead by a day… leaving tomorrow. The train to the airport is in operation …. confirmed in person at the station tonight. The hotel is very quiet. The person at the front desk told me all the guests had checked out. This person is a French who has been in Tokyo for three years and speaks fluent Japanese (with no accent!) said he isn’t scared….not even the nuclear plant meltdown if and when it happens. He is very confident of the Japanese’ ability to contain and control it. He has no intention of going back to France as he now calls Japan his home. Life on the street is as usual….in Ikebukuro, in Shinjuku, in Tokyo, in Ginza….my round of tours today and my walk of the day. The D train and more…. It’s the ‘D’ train…the wrong train….wrong in the sense that it is the local train for the locals with 3 train switchings along the way. But after 3 hours (not 90+ minutes), I am back in Tokyo. Things along the way seem calm and peaceful. Life is normal in Tokyo…as if no disasters have happened. People dine out. I walked 2 subway stations after getting off the train, not because I fear the quake and the service, but I simply need the exercise. I enjoyed a sumptuous Chinese dinner on the way back to the hotel. I was told that the Narita Airport is closed. No flights out yesterday and today. Some hotel guests scheduled to fly out today were rescheduled to March 15, Tuesday. So, I had better email (no point to call…phone lines not working) Singapore Airline to confirm my flight on March 15. My next stop is Singapore, not HK. Hotels stop all elevator service (power supply unstable). Guests are told to leave building immediately when it shakes. Notices are distributed to warn guests of power outage in certain hours tomorrow. Reminder to use the flash light and keep it in its place. I was advised not to go to Kamakura as it is closer to the coast and in the way where the tsunami is moving. Subway is a better way to go than the JR trains above ground. But I will exercise my legs to extent possible. I subscribed to the train service alerts provided by Google to keep me apprised in English on what’s happening. I failed to understand the Japanese on the web sites. “Leaving in 2 minutes”….so I was told at the train station information booth. The station guy didn’t even bother to check the contents of my pass but simply asked me to hurry up. So….I did. I waved at the train master to signal I was coming. I didn’t even have time to buy my bento box, but who cares. In disaster situations like this, I will board whichever is the first available train. I only hope this is not the “D” train. It’s 13:59. I have a bar of large Cadbury chocolate (with fruit and nuts), few raisins, a handful of almonds and a mug of freshly-brewed tea with me. That should keep me going till I arrive in Tokyo 90 or so minutes later. I used to munch on a pack of Cadbury chocolate (same as now but only a smaller pack) and tea each day when I worked in Citibank in the early 70’s. I only weaned myself from them when I started to carry my first child. Tea, nuts, raisins and chocolate are a lovely combo! On reflecting back and as I get older, I do firmly believe that things do happen for a reason…. · My train pass – the very last minute at the point of sale, I made a change from a 2-day pass to a 3-day one. There wasn’t any premonition of a disaster and getting stuck on the second day. · My Skype communication tool – I set it up only the night of my departure for Nikko….simply to make call to UK to cancel my reservation at the bunk-bed hostel in Tokyo. Now with LAN and cell lines out, the Skype is my means of communication where there is Internet connection. · My knapsack stuff – I carried 2 days of underwear instead of 1 just in case. And, now I got to use the contingency supply! I only consumed the biscuits and chocolate cookie yesterday to save some of my energy-replenishment supply for today. · My stay – Nikko is a quaint little resort-type of town, only much smaller than those in resorts like Banff. On the day of my arrival, it was sunny with the snow-capped mountains standing so gorgeous against the bright blue sky. I told myself I like the town and could come back again in the Fall or Summer. Now, I have my wish of extending the stay, though not in such positive way. · My coffee shop – I didn’t have a chance to go back to the clean and quiet UCC Cafe to enjoy my cup of brewed coffee (the only brewed coffee in town). Well, it’s something for my next trip here….that cosy shop with its own flair. · The cats’ meow – the night before the quake, the cats were meowing a lot outside the window. On the night of the quake (last night), some meows were more intense. The cats must have sensed the heat! The town is very quiet today despite it’s a Saturday. The tourist loop bus is empty. When I saw no crowds in front of the train station from afar, I asked myself if this was a positive or a negative sign. But the fact taxis are stationed at the entrance, I tell myself it’s more of the former. The train is packed. I cleared the seat beside me for the next passenger. In times like this, who in the crowd would like to stand all the way on the 90+ minutes’ train ride? 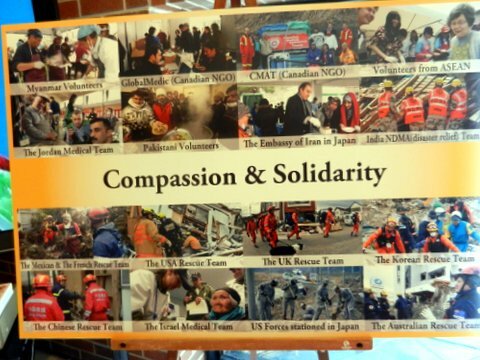 I am chuckking out to the train station now to check out the train service as well as to grab a bite in my favourite UCC Cafe, one with style and flair and brewed coffee … 1 p.m.
Before I go, can’t help but send a word on the emergencyand disaster readiness of Japan…. In our hotel room in Tokyo, tiny as it is, there is a flash light. Now that disaster has hit, I carry my own torch in my shoulder sidebag instead of in the knapsack to facilitate easy retrieval. A lot of places are out of electricity when disaster hits. The EXIT sign in my family guesthouse is large and bright. The green leon signboard is 2 feet by 1 foot. Even in the dark, there is no way to miss it. There is one upstairs and downstairs in my host’s house. My host showed me the way to the outside thru these exits. There are places around town designated as emergency or disaster shelters. I spotted a number of these in Tokyo including the Ueno Park. When the LAN lines and cellphone network are jam-packed, there are special numbers one can call to deposit and to retrieve messages. In this way, family members and people can continue to communicate with each other to convey their own situation. Now with Internet, there should b e more of these facilities. Everyone who carries a cellphone (at least here in Nikko) will be sent messages of upcoming disaster warnings. In this way, one can tell if a strong quake is hitting or not. Police are out at work to keep order and guide people to shelters. At the Nikko train station, some volunteers who speak English were present yesterday to communicate with those who do not understand Japanese. Relief forces are out at work immediately. According to my host, railway companies work overnight to inspect train lines right after quakes to ensure services can resume as soon as possible. This is on top of the government emergency service units out at work. People are accounted for as soon as possible and statistics are tallied. The Prime Minister calls meetings and issues instructions (can’t understand Japanese but guessing from the TV screen) at the earliest possible time. Their houses are built to withstand quakes (from TV shows I watched before). My host also told me the highrises in Tokyo can withstand strong quakes. Are there more? Could be. But so far, these are my observations and experience. Someone asked me if there is something Chinese can learn from Japan. This emergency and crisis management is one. I hope “our fellow countrymen” who visit Japan won’t steal the torches from the hotel rooms …… or in their own hometown when the latter’s hotels are so equipped! The sun shines brightly this morning. It’s another day… hopefully a good day and things are turning bright. The train service to Tokyo has not yet resumed. So, I am spending time in my host’s common room clearing emails and doing chats over Skype. The aftershocks are still going on. Sitting here, there are the occassional long rocks. The same when I was on my tatami last night. The sway….the rattle….I am used to them. At least, a roof, a hot shower, a comfortable and warm bed, a rest (despite the first part was wide-awake last night) a coffee and hot tea now beside me…..I am happy. My host went to the supermarket (a convenience store) and said all food were sold out. Boy! I should have grabbed more bento boxes last night. Here I sit, waiting for train service, but at least I am inside a home and not in the open air (the police had to get all people in the train station out in the open yesterday to play safe). And, I don’t need to keep going on those “Heritage Tour’ busloops to keep myself warm inside the bus and to kill time. (Good that I bought a pass with unlimited ride!!!). Ha, ha, what an Ah Q. According to my host, it’s more safe here in Nikko than in Tokyo. Nikko is a safe place, otherwise all the important shrines (Toshugo Shrine as an example) wouldn’t be bulit here. Over the TV, statistics on the quake and tsunami impact are showing. I think I will get to learn Japanese if the TV is kept on. I will have more tea and maybe work on the Sudukos in the International Herald Tribune paper. Thanks again for all the other emails that flew my way and the information on HKSAR’s Help information. Yes, I do have my HK ID card with me. So, either I can be a HK citizen (and get rescued out as one) or I can use my Canadian passport and pay my fees (yes, the Canadian Govt. charges for foreign country evacuation service) to get out as a Canadian. But either way, I need to find my way to Tokyo first. In fact, on the night of March 9, I felt some ‘movements’ while in the bathroom of my hotel in Tokyo. I thought it’s just me. But someone from NYC told me they caught the news of minor shock that day. So…after all these instances, I have to give myself confidence….and tell myself that whenver such thing happens, it’s the earth that is shaking, not me! I am glad I went up the mountain the first day when I arrived when the weather was sunny. I also went for my walk of 90+ minutes yesterday morning when the quake hadn’t happened. The feeling of walking in the dull overcast sky and amongst those dark dreary temples yesterday in the late morning wasn’t a good one. Now, the sky has brightened up and it does cheer me up. My Skype is on. Anyone interested to chat, please do call me. My ID is Skyperoseho. I am glad I set it up the day of March 9 in Tokyo when I tried to reach the booking agency to cancel my stay in the bunk-bed hostel. Now that I have made quite a number of calls to HK, Canada, US and UK, I have only spent under HK$20! Sorry for the long message….but it’s my killing time here! Thank you for all the thoughts of yours that fly in from both the East (who caught the shocking news over TV) and those early birds in the West who caught it over the Internet. I am alone in Nikko, Japan, but I am safe. I am in good hands. The host of my family guesthouse is a senior experienced in dealing with earth quakes. All I need is to follow his instructions. The crisis handling situation is also very mature in Japan. According to my host, Japan usually brushed off earthquakes that are 6.x magnitude. This time when it is 8+, it is serious. One of the nuclear plants has a shut-down problem. The people in that area has been asked to evacuate. My host corrected me that Sendai is NOT on my way to Tokyo….so once the train resumes, I can get back to Tokyo (no airport in Nikko). In Tokyo, the subway service has resumed. People are inspecting and repairing train tracks overnight. So, hopefully, I can find my way back to Tokyo tomorrow. The quakes are going on (now I am used to them!). There is non-stop TV broadcast on the quake, tsunami and situations over the whole country. I don’t think I will continue the rest of my journey in Tokyo. I will simply hang around my hotel. I chopped my bunk-bed hostel stay in Tokyo (before I came to Nikko) because I don’t like it (not clean to my standard). The rest of the trip….and more….next time! Once again, thanks for all the help, advice and kind thoughts. Am brain-dead, dead tired being out in the open cold for the whole day. Need to sleep soon. (My host says it’s safe to sleep upstairs. I asked him should I stay in this common room the whole night (as there are hard tables for shelter)!